Junior has an unusual condition called Ocular Hermaphroditism; it makes one eye look feminine and inappropriately sultry, and the other clear-eyed and fascinated. He appears to have been huffing from a bag of lawn fertilizer, unaware of the peril beyond the shores. Dad is doing a good job of Keeping It Together. He is aware he may be drafted. That is not exactly what he had expected; you can almost see the gears and flywheels spinning behind that expression, as he tries to map the future. All roads seem to lead away from the place he wants to be. If he has to go, he will, but he’s not leaping up and down about it. Mom is radiant and resolute and beautiful, because she is the target audience for the magazine. Note how Dad and Grandma have the same olive-drab colors; little mister cannon fodder is brown, but Mom is the color of heart-muscle tissue. She holds the Future, for whom this war will be fought. The sections concern the Family home, Feeding and the Family, Family Fashions, and Family Fun. 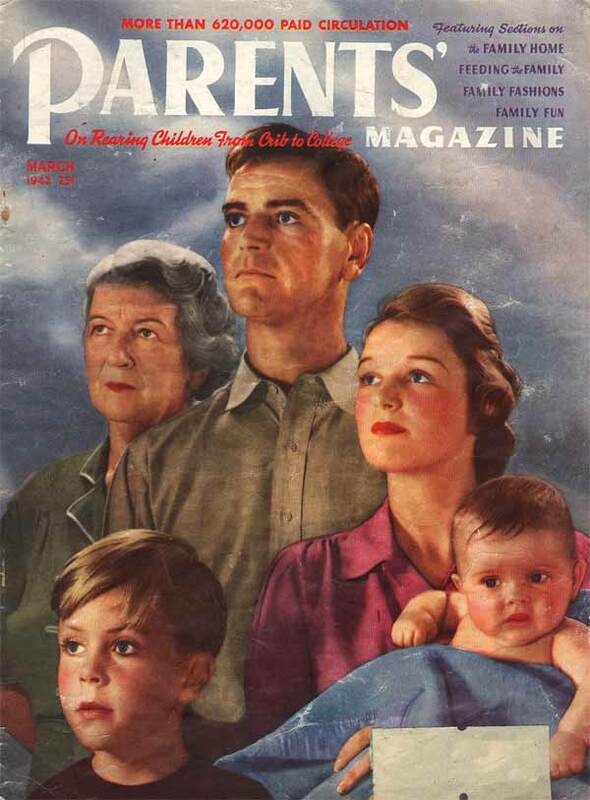 It’s a magazine about the Family.